Galaxies are made of three main ingredients: stars undergoing various degrees of stellar evolution, clouds of gas and dark matter. Even as scientists are convinced that they are right about everything, nobody knows what dark matter is. 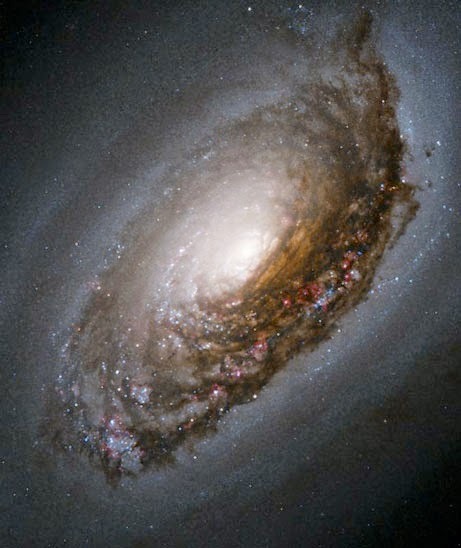 Some scientists opine that dark matter might be constituted of "supersymmetric" particles. Supersymmetry is a theory in which all particles in our Standard Model -- electrons, protons, neutrons, and so on -- have a more massive "supersymmetric" partner. While there has been no experimental confirmation for supersymmetry as yet, the theory would solve a few of the gaps in our current thinking. One of supersymmetry's proposed particles would be stable, electrically neutral, and only interact weakly with the common particles of the Standard Model -- all the properties required to explain dark matter. But that's a theory and while scientists make a respectable living assembling this sort of theoretical model -- nobody knows what makes up the greater part of the Universe. So much for mankind having the answers. Is there a God? Progressives (in particular) make the case for no God and ridicule prayer. However those same people have no problem believing in invisible rays that travel from point A to point B and bring a message to their i-phone. I realize that is not considered a fair comparison. Mankind's knowledge is based on a very small subset of information, but we think that it's huge. We have no idea what makes up well over a third of the known universe and is the glue that holds everything together. Today is Easter and people around the globe will celebrate the resurrection of Jesus Christ. I wish them and you a Happy Easter. I hope that you are able to spend time with those you love here and now with the understanding that what we do in this life, echoes in eternity. Sometimes you're the windshield and sometimes you're the bug. It's true in life and it's particularly true in politics. The question that Hillary Clinton needs to ask herself is whether or not her husband, Bill's, coat tails are long enough to drag her into the White House. I don't know anyone who met Bill Clinton and didn't leave the meeting without liking the guy. It doesn't mean that they agreed with him, but he's a likable rogue. I don't know anyone who left a meeting with Hillary Clinton who had that innate sense of charisma fall down on them. In fact, quite to the contrary, she's reptilian. How will the public react to the cold, reptile as she runs for the presidency with her history of lies, deleted e-mail and baggage in her wake? Even Elizabeth (Fake Indian) Warren has less baggage than Hillary Clinton -- but as Hillary tells everyone, it's "her turn" to be president. I believe that the American people may react differently than the Democratic Party hopes that they will.